Piano has been a part of my life, even before I was born with my mom practicing for her advanced RCM exams. Having a piano teacher as a mother meant my exposure to music started early, although informal. I started with formal lessons around 4 years old. The great thing about starting young is that I don't remember a time in my life where I didn't play piano and practicing has always been a part of my life and balanced with extra curricular activities. As I grew up I also discovered I had a natural talent for teaching so pursuing my Bachelor's of Education degree and Royal Conservatory of Music Grade 8 certificate was a natural choice. I started my music business, Harmony Music Consulting, in 2012. It has taken me on quite the adventure to India and back. 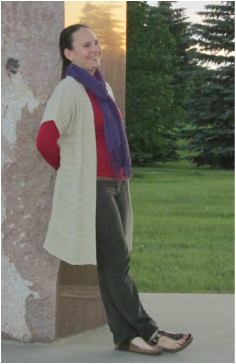 I am now settled down in Regina and teach piano lessons and host camps at my home studio located in Coronation Park. In 2016 I was able start doing the thing I love most (teaching piano) as my full time job. I have a special spot in my heart to help people of all ages discover the joys of music. My wish in life would be for every child to learn music. However, music lessons can add up and not every child is able to take lessons. Creative Kids Saskatchewan is a non-profit that provides sponsorship to hundreds of children across the province allowing them to participate in the arts. I became an approved teacher with Creative Kids Saskatchewan in 2015 to help kids in Regina meet their goals of learning piano. I also like to live on the adventurous side - I enjoy snowboarding and skating in the colder months and riding my motorcycle and going for walks in the warmer months. I am also currently working on my Royal Conservatory of Music grade 9 certificate and will soon be adding the Elementary Teacher Specialist course offered by the Conservatory to my resume. New themes are nearly ready for the 2018-19 school year! I am also looking forward to presenting each student with their assignment books that reflect their interests and learning goals for the year. Composition, scales contest, arranging challenges, practice punch cards and other challenges are on the books for the upcoming year. The treasure chest is also coming back by popular demand.